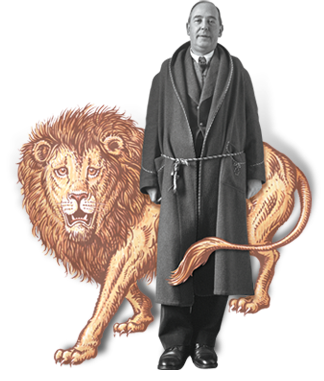 Most Lewis fans know a great deal about the adult C. S. Lewis, the author of the Chronicles of Narnia, Mere Christianity, and The Screwtape Letters. Some know about his childhood years, largely because they have read Surprised by Joy. Various biographies tell us about his early experience with schools, his war service, his university years, his search for a teaching position in Oxford, and his academic career, but not much attention is really paid to his undergraduate experience. This article will look more closely at one aspect of Lewis’s undergraduate years, his involvement with the Martlets, an undergraduate literary society of University College. There we will see the young Lewis, in love with literature, especially poetry, with developing tastes that are not yet fully formed and haven’t yet had his tastes filtered through the lens of Scripture. The Martlets are one of the longest-standing undergraduate societies of Oxford University, one in which C. S. Lewis was involved both as an undergraduate and as an Oxford don over a period of more than two decades and one which served, in a sense, as a successor to his relationship with his private tutor W. T. Kirkpatrick and as a precursor to the give-and-take of the Inklings and the Socratic Club. The Martlets are the only undergraduate society whose minutes are preserved in the Bodleian Library, and the society remains in existence today. The thorough article written more than forty years ago by Walter Hooper, which is one of the few articles on the subject, quotes from the minutes of the Martlets extensively, and the reader is referred to that fine article for those quotations. The term “Martlet” comes from English heraldry, and it refers to a bird in the swallow family, possibly the house marten. The ending “-let” is a diminutive ending, and the image of the Martlet in art is one with no feet. As a society of University College, it probably derives its name from University College’s coat of arms, which has four (sometimes five) gold Martlets around a gold cross on a blue background. The coats of arms of Pembroke College, Cambridge; Worcester College, Oxford; McGill University, Montreal, Canada; the University of Houston Law Center, Houston, Texas; and the University of Victoria, Victoria, British Columbia also include the Martlet. Not surprisingly, most of them have a strong historical connection with the United Kingdom. Some websites state that the Martlet is a mythical bird that represents the ceaseless pursuit of learning, which, since it has no feet, is always soaring in search of wisdom and knowledge and never landing. Some sources describe it as a crest that indicates a fourth son, who did not have the right of primogeniture and also did not, like the second and third sons, serve the Church. In place of an inheritance, that position would create a restlessness, which would motivate hard work and perseverance, some of the same qualities needed in the pursuit of knowledge. The Martlets of University College are a society dedicated to literary matters, although there is some evidence that they had other interests in the past, and the interest and relevance of the Martlets also appear in the fact that, in Lewis’ day, both Oxford and Cambridge had such a society. The two Martlets societies occasionally met together with one of the societies sending a few members to the city of the other society for a joint meeting, at least during the years that Lewis was either Secretary or President of the Martlets. The minutes of the Martlets show six joint meetings during these years between 1920 and 1923. The first took place on Tuesday, March 9, 1920, when the Oxford Martlets had dinner with the Pembroke College Cambridge Martlets at 7:15 p.m., wearing dinner jackets, in the Junior Common Room of Univ. Likewise, on November 29, 1920 the Oxford Martlets Society, represented by Lewis, G. O. Vinter, A. Hamilton Jenkin and R. M. S. Pasley, were the guests of the Martlets of Pembroke College in Cambridge. At this meeting Lewis read his paper on “Narrative Poetry.” On Wednesday, Feb. 23, 1921, three Martlets from Pembroke College Cambridge were guests of the Oxford Martlets. They had dinner together in the J.C.R. before the evening meeting. Then “on reassembling in Mr. Long’s rooms, the President asked Mr. Ayling to read his paper on ‘O. Henry.’” There is no record of a meeting during Michaelmas Term in 1921. In the next year, on Wednesday, Feb. 22, 1922, the Cambridge Martlets met with the Oxford Martlets in Oxford and heard Mr. Clift, probably a Cambridge Martlet, present a paper on “Books, Life and Carpet Slippers.” On Wednesday, Oct. 25, 1922, the Oxford Martlets planned to travel to Cambridge to meet with the Pembroke College Martlets and hear a paper on “Robert Burns,” although it is not certain that this meeting occurred. On Feb. 21, 1923, the Cambridge Martlets came to Oxford, enjoyed dinner in the J.C.R., and Noel Paton read a paper on the “Short Story of Today.” Their joint meetings appear to have taken place twice a year with the Cambridge Martlets traveling to Oxford in the Spring and the Oxford Martlets traveling to Cambridge in the Fall. The guest society would provide the paper, and the host society would provide the accommodations. The Martlets ceased to meet during the First World War. Robin Darwall-Smith writes about the society after the war, stating that it offered “the same pre-war mixture of papers from undergraduates and senior members.” Among the senior members of the University, G. D. H. Cole (presenting on detective fiction), Ernest de Sélincourt, and C. S. Lewis himself presented papers, and among outside members Ronald Knox and Cecil Day Lewis presented papers. After service in World War I as a Second Lieutenant in the 3rd Battalion of the Somerset Light Infantry, Lewis returned to Oxford University on January 13, 1919. He was elected Secretary of the Martlets two-and-a-half weeks later on Friday, January 31, 1919, the 188th meeting of the Martlets, during the Hilary Term. That date is the first known Martlets participation by Lewis, while Nov. 14, 1940 is the last. Since Lewis was elected president of the Martlets in the 196th meeting, the 188th through the 195th meetings were summarized in Lewis’s own handwriting. While one would have to read the paper that was presented at each of those meetings in order to assess fully Lewis’s minutes, the summaries are well written and appear to capture the paper presented. Since the Martlets normally met about twelve times a year (four meetings each term), the Martlets, who did not meet during World War I, would have been in existence for at least fifteen years. In fact, the first minutes of the Martlets date from 1892, although Lewis himself thought the Society was at least three hundred years old. Lewis’s early influence on this group was shown by the fact that he proposed as the topic for the coming term “The Poetry of Mr. Yeats,” a topic that was approved by a majority of those present. At the time Lewis was very interested in Yeats and would visit Yeats twice, after Yeats moved to Oxford in late 1919. As noted earlier, Dr. A. J. Carlyle presented a paper on W. B. Yeats on Feb. 12, 1919, the 189th meeting of the Martlets. After serving as Secretary for eight meetings, i.e. two terms (Hilary and Trinity), Lewis was unanimously elected the President of the Martlets at the 196th meeting on Wednesday, Oct. 15, 1919, the first meeting of Michaelmas Term. He served in that capacity for the next two years through the Trinity Term of 1921, being reelected once on June 17, 1920. “The Society consists of 12 undergraduate members, (former) graduate members being honorary members. “Four meetings of the Society are held each term. In this brief description, we see two of the strengths of the Martlets. First, they had the support of faculty members, who served in significant numbers as honorary members. Most undergraduate societies today are fortunate to have even one faculty member who will work with them. Second, they limited their membership to twelve undergraduates, thereby creating a kind of exclusiveness that elevated the society. To be elected to the society required more than seventy-five percent of the members to vote in favor of the new candidate, as the constitution indicates below. Today that limited membership would probably not be possible, since an exclusive society would be criticized (and, in most universities, not even allowed) as not being inclusive enough. That would lead to a wider and more diffuse membership with undergraduates of all abilities being involved. The quality of the meetings would eventually drop, and then the same would happen to attendance. The exclusiveness of the Martlets added to their prestige and probably created interest. The nature of the Martlets is more clearly seen when one reads the Constitution that was proposed in 1923. That this society be called the Martlets of University College. That it meet four times a term for the purpose of hearing papers of literary interest either from the viewpoint of their subject or matter. That the society consist of 12 undergraduate members also of such members of the senior common room as the society shall be pleased from time to time to elect and of such graduate members as are still in residence, these latter shall be called honorary members. That ex-presidents, even if they are still undergraduates, be added to the honorary list. That undergraduate members be elected by a full meeting of the society, one contrary vote cancelling three favorable. Every candidate for membership shall have been present at at least one meeting of the society as a guest before his name shall be proposed. That no undergraduate be elected a member in his first term. That the office-bearers of the society consist of a president and a secretary. That the duties of the president are to preside at all meetings and to open the subsequent discussions on the paper which has been read. That the duties of the secretary are to record the proceedings of each meeting in the minute book and to read these minutes at the subsequent meeting. He shall also arrange the business of the society and see that the fixtures for the term are in order. That every undergraduate member be obliged to attend at least two meetings every term and that if anybody fail to do so it is in the power of the president to ask him to resign. On several occasions Lewis read a paper to the Martlets, the first time on March 12, 1919, on the writings of William Morris. R. M. S. Pasley read Lewis’s paper for him, apparently since Lewis was the Secretary and needed to take notes on the proceedings of the meeting. One sees the seeds of a later essay that Lewis wrote on Morris, one that eventually appeared in Rehabilitations and Other Essays. In fact, another paper on Morris was read by Lewis to the Martlet Society on November 5, 1937, and this was the one that appeared in 1939 in Rehabilitations. But more on that later. Since Lewis loved the writings of William Morris, it does not surprise us that the notes were brief, and that, in the interest of honesty, Lewis had to report, “The general sense of the Society was that rather too high a position had been claimed for William Morris.” Lewis himself would later agree that his paper on Morris was not nearly as good as he had thought. Lewis read a paper on narrative poetry to the Martlets on Nov. 3, 1920, extolling the merits of the long poem, merits that he was in the midst of attempting to demonstrate with his long poem Dymer, which he had begun in December 1916 and was published on Sept. 18, 1926. While many contemporaries were not impressed with this style of poetry, allegedly because too many of them were unwilling to read poetry that long, Lewis defended narrative poetry, in part because of the ability of the long poem to portray and develop character, using examples from John Milton’s Paradise Lost, Edmund Spenser’s The Fairie Queene, and John Masefield’s Reynard the Fox. His next paper was delivered on the poetry of Edmund Spenser on Feb. 14, 1923. He spoke of Spenser’s technique as seen in his vocabulary and metrical execution. He advocated reading The Fairie Queene in large gulps rather than piecemeal, which enables one to see both the variety and the unity of the poem. The discussion that followed was recorded by Lewis in his diary. In that diary, G. A. Rink, William Robson-Scott, George E. Fasnacht, and Lewis discussed the nature of art and communication in language that depends in part upon an understanding of the Italian idealist philosopher Benedetto Croce and Plato’s idea of Form. While it is hard to follow the conversation, we see Lewis arguing, as he does later in An Experiment in Criticism, that art (or literature) is to be experienced and enjoyed rather than used or criticized. He sees art as a social venture, able to communicate with its audience, and not something merely about disinterested expression. Then, on June 18, 1924, Lewis read a paper on James Stephens, giving a favorable appraisal of Stephens’ prose works while congratulating himself on the fact that he knew nothing of Stephens’ personal life. Walter Hooper correctly comments that here we see “the germ of Lewis’s belief that a book ought to be judged on its own merits rather than as part of the writer’s autobiography,” a position that he spelled out further in The Personal Heresy. His next paper for the Martlets, his fifth, was read on the same day that he learned that he had been elected a Fellow at Magdalen College, Oxford. The paper, read in the evening of May 20, 1925, was on James Boswell, Dr. Samuel Johnson’s biographer. The current treatment of Johnson, who has the reality of art, Lewis stated, is due to the skill of Boswell, who was a brilliant writer and a great artist in his own right. Boswell’s The Life of Samuel Johnson, L.L.D. produces the illusion of life more than any other work of fiction or history. Lewis next read to the Martlets the paper “William Morris” on November 5, 1937, defending Morris against the negative reaction toward Romanticism by discussing Northernness, Morris’ “matter-of-factness in expression,” Morris’ treatment of love, and his theological paganism. Morris, he argued, exemplified in his writings the internal struggle between the love for mortal life and the longing for immortality, a struggle that Lewis himself had experienced at the same time that he was reading Morris during his pre-Christian years in the 1920s. The essay that Lewis read is undoubtedly the same essay that appears both in Rehabilitations and Other Essays and Selected Literary Essays. The next paper that he read to the Martlets was entitled “Psychoanalysis and Literature,” read in the Trinity Term of 1940, a term that began April 21 and concluded July 13. While the precise date of the meeting is not known, his paper was delivered at some point during those three months. If not precisely the same paper, Lewis had given a very similar paper on January 28 and 29, 1940, entitled “Psychoanalysis and Literary Criticism,” first to the English Adventurers Society, a literary society at Westfield College in Oxford, and on the next day at St. Peter’s in New Inn Hall Street. On Oct. 4, 1942, he also gave a BBC talk on Morality and Psychoanalysis, which may owe something to Lewis’s original essay on psychoanalysis. Furthermore, on three separate occasions the Oxford Socratic Club addressed psychoanalysis, probably with Lewis in attendance, first on May 16, 1949, next on October 24, 1949, and thirdly on May 13, 1954. In none of those cases was Lewis one of the speakers, but, if in attendance, he could hardly have kept silent on the topic. For C. S. Lewis the Martlets provided an early arena in which the give and take of academic debate could take place, a kind of successor to his time with W. T. Kirkpatrick and a precursor to the Inklings. Here Lewis showed himself an impressive intellect, confirmed by his election first as Secretary and then as President of the Martlets, and he was able to express some of the seminal thoughts that later characterized his academic career. Among them were his love of poetry, his early enjoyment of W. B. Yeats, his appreciation for William Morris, his dislike of vers libre, his antipathy toward modern literature, and his opposition to the personal heresy. Here we see the young and pre-Christian C. S. Lewis gradually becoming more confident in his literary sensibilities, unafraid to voice his views in front of others. Darwall-Smith, Robin. A History of University College Oxford, Oxford: Oxford University Press, 2008. Heck, Joel. “Chronologically Lewis.” www.joelheck.com. Hooper, Walter, ed. C. S. Lewis: Collected Letters, Volume 1, Family Letters 1905-1931. London: HarperCollins Publishers, 2000, p. 1000. ________. “To the Martlets,” in C. S. Lewis: Speaker & Teacher. Carolyn Keefe, ed. Grand Rapids: Zondervan, 1971, pages 37-62. Lewis, C. S. All My Road Before Me: The Diary of C. S. Lewis, 1922-1927. New York: Harcourt Brace, 1991. Christianity, edited by Walter Hooper, Glasgow, Great Britain: William Collins Sons & Co. Ltd., 1975, 104-125. Minutes of the Martlets. Ref. MS. Top. Oxon. d. 95 (1919-1923). Minutes of the Martlets. Ref. MS. Top. Oxon. d. 95/3-5 (1923-1946). C. S. Lewis: Collected Letters, Volume 1. 1912-1930. Edited by Walter Hooper. London: HarperCollinsPublishers, 2000, 430. See the “Sport, music and college facilities” section of the University College website at http://www.ox.ac.uk/admissions/postgraduate_courses/college_guide/university.html. Walter Hooper, “To the Martlets,” in Carolyn Keefe, ed., in C. S. Lewis: Speaker & Teacher. Carolyn Keefe, ed. Grand Rapids: Zondervan, 1971, pages 37-62. The website of Pembroke House, located in Gilgil, Kenya. See http://www.pembrokehouse.sc.ke/the-martlet-bird/. See also http://martlet.askdefine.com/. The Cambridge society appears no longer to be in existence. A. Hamilton Jenkin (1900-1980) read English at University College, Oxford from 1919 to 1922, the first lifelong friend Lewis made at Oxford. See C. S. Lewis: Collected Letters, Volume 1, 100 for information about Hanilton Jenkin. Sir Rodney Marshall Pasley (1899-1982) was a Second Lieutenant in the Royal Field Artillery during World War I, earned his B.A. from University College in 1921, and served in educational administration during his career. C. S. Lewis: Collected Letters, Volume 1, 432, n. 25. Junior Common Room, the undergraduate lounge. Ref. MS. Top. Oxon. d. 95, 118. Oxford tutor in ancient history, whose class Lewis took, who wrote recommendations for Lewis during his applications for various teaching positions, and whose daughter Lewis tutored in Latin. Professor of Poetry, Professor of English, Vice-Principal of Birmingham University, and editor of Spenser and Wordsworth. Blackwell’s later became a major publisher and is now part of Wiley-Blackwell publishers. Walter Hooper, “To the Martlets,” p. 57. Robin Darwall-Smith, A History of University College Oxford, Oxford: Oxford University Press, 2008, 460. Ibid. There may be an error here, since the topic presented by Cole is the same as that presented by Ronald Knox. Walter Hooper, “To the Martlets,” p. 39. The Lewis Papers, a letter to Albert Lewis, Feb. 4, 1919, page 86. Walter Hooper thinks that there may be some precursor to the Martlets that is shrouded in history. Hooper, “To the Martlets,” p. 39. He visited Yeats’ home in Oxford on March 14 and 26, 1921. This phrasing is part of the “some evidence” that the Martlets addressed other than literary matters, mentioned in the fourth paragraph of this article. MS. Top. Oxon. d. 95/4. MS. Top. Oxon. d. 95/3, 70. In 1959, Lewis wrote, “The critic was, I now believe, quite right in thinking it the worst essay in the book; at least everyone agreed with him.” C. S. Lewis, “Fern-seed and Elephants,” in Fern-Seed and Elephants and other essays on Christianity, edited by Walter Hooper, Glasgow, Great Britain: William Collins Sons & Co. Ltd., 1975, 104-125. Minutes of the Martlets. Ref. MS. Top. Oxon. d. 95, 108. My summaries of Lewis’s papers are based on my reading of the minutes for that meeting of the Martlets. All My Road Before Me: The Diary of C. S. Lewis, 1922-1927. New York: Harcourt Brace, 1991, 197-200. Novelist and poet James Stephens (1882-1950) is the author of The Charwoman’s Daughter, The Crock of Gold, The Demi-Gods, and Deirdre, among other works. Hooper, “To the Martlets,” 52. MS. Top. Oxon. d. 95/4, fo. 31. MS. Top. Oxon. d. 95/5, fos. 99-100. MS. Top. Oxon. d. 95/5, fo. 132, cited in Hooper, “To the Martlets,” 59. This entry was posted in Joel Heck and tagged Inklings, Martlets, Oxford, Socratic Club, undergraduate, Walter Hooper.